He is the 5th and youngest son of his family, and tells Konekomaru he's glad of this because it means he has less responsibilities. His older brother Juuzou says he's the pervert out of the brothers. 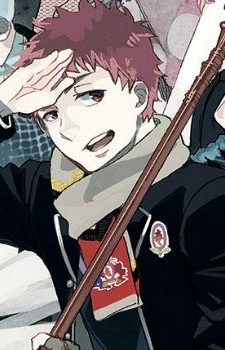 He has pink (dyed) hair. It is naturally black. In the manga, Renzou wears a man-tailored (flannel sort of) shirt over a t-shirt with a symbol, sort of like a bulls-eye. Renzou also carries around K'rik (Khakkhara) staff, which he and his two brothers also have. Renzou is a carefree character and was the first person to actually befriend Rin since the revealing of the blue flames, which shows Renzou is the friendly-type. He is also afraid of bugs, yet he is known as the pervert out of the Shima brothers. Renzou was born into the temple that Bon and Konekumaru was in as well, making him the childhood friend of the two. In chapter 48, he comes out as the spy of Illuminati.